An alternative iconological approach derives from the work of Erwin Panofsky. In an early essay Panofsky (1915) argued that that art is based both on a particular perception of the world [Anschauung der Welt] and on a particular worldview [Weltanschauung]. For Panofsky, both art and art history are based both on perception and the preformed intellectual views and preconceptions of the observer. the aesthetic point of view offered an individual judgment of taste, a love of beauty for its own sake rather than any understanding of the conditions of the appearance of historical beauty. In this way, the aesthetic point of view enabled aesthetic phenomena to remain "isolated" and "self-sufficient"—"simply there." Panofsky considered his approach to be a shift from iconographical analysis to iconological. The pre-iconographical (primary or natural) level is the initial perception based on viewing the picture. It relies on what the viewer might be familiar with or know, as an aid in an initial (surface) interpretation of meaning of the work. A meaning influenced by association with personal practical experiences. For Panofsky, this primary meaning consists of, first, the 'factual meaning' of an object, which is the identification of the lines, colours, shades, form and so on (the artistic motifs) as representing something (such as a building, person, tree). Second, is the 'expressional meaning', which is the identification of emotions evident in the visual object (for example, joy, fear, pain). Both the factual meaning and expressional meaning can be interpreted on the basis of everyday life experience, no knowledge of the cultural background of an image is necessary. The iconographical (secondary or conventional) level involves a deeper interpretation of the primary level. It goes beyond the level of sensibility. Iconography analyses the world of images, stories and allegories and requires knowledge of literary sources, an understanding of the history of types and how themes and concepts were expressed by objects and events under different historical conditions, The prior knowledge of concepts and artistic conventions, historically situated, allow the artistic motifs and visual codes in the image to provide a more nuanced recognition of the events taking place in the image. (See CASE STUDY Iconographic analysis). The iconological (intrinsic) level attempts to go beyond the surface apprehension of the pre-iconographic level using the iconographic information to reach the ultimate goal of iconology, which is to reveal the underlying 'basic attitude of a nation, a period, a class, a religious or philosophical persuasion—unconsciously qualified by one personality and condensed into one work' (Panofsky, 1939, p. 7). These basic principles direct the choice and presentation of artistic motifs, 'as well as the production and interpretation of images, stories and allegories, and which give meaning even to the formal arrangements and technical procedures employed' (Panofsky, 1939, p. 14). In the study of intrinsic meaning of art, a work of art thus becomes a symptom or a reflection of something external to it. The attributes that reveal these underlying principles are called symbolic values and these are to be discovered by the scholar using 'synthetic intuition' (Panofsky, 1939, p. 8). The three phases, then, each provide the basis for the next level of analysis. However, the pre-iconographic description is controlled by an understanding of how objects and events were depicted in specific forms in a specific historical period (the 'history of style'). An iconographical description can be corrected with an insight into how 'themes and concepts were expressed by objects and events' in the particular historical period ('history of types'). During an iconological study synthetic intuition also depends on understanding how 'essential tendencies of the human mind were expressed by specific themes and concepts' (Panofsky 1939, pp. 16). Panofsky (1939) following his earlier concerns about the possibility of 'scientific' approach to art history, set out, in Studies in Iconology, the understanding and interpretation of meaning in visual representations. For Panofsky, iconology provides a means of interpreting the history of art by revealing the cultural, social, and historical background of visual art works. Iconology, thus, goes beyond iconography, which Panofsky regards as an approach that is focused on classifying works of art, establishing dates and provenance and specifying any other information about the work. Panofsky, sees iconology as the way to get to the meaning of works of art. Renan Mazzola (2015) noted how Panofsky compared the analysis with the diagnosis of a medical practictioner. So, for Panofsky, iconology tries to reveal the underlying principles that form the basic attitude of a nation, a period, a class, a religious or philosophical perspective, which is modulated by one personality and condensed into one work. Iconological analysis, in its situating and grasping of meaning, however, is liable to identify things of which the image maker may not have been aware. The Introduction to Panofsky's (1939) Studies in Iconology, provides a detailed statement of panofsky's approach with examples. The conceptual system of scientific art history can best be developed, then, by beginning with the work of art and forming hypotheses about it. Art theory, in other words, begins with looking. Commencing with the work of art, the theoretician inquires into the fundamental concepts of fullness, form, time, space, and their relations to one another. The general questions generated by this inquiry are then proved or disproved by the visual record. In this way, "the art theoretician determines the goals toward which the empirical researcher orients himself step by step." Without orientation to the "state of affairs" offered by art theory, art history would, Panofsky writes, remain an aggregate of "one hundred, one thousand single observations." …The movement Panofsky traces from the aesthetic contemplation of a single object to the engagement with artistic problems, and onward to the ultimate goal of the discovery of fundamental concepts and principles, is likewise a trajectory from seeing to representation to knowledge. While an atheoretical art history is criticized by Panofsky for both isolating the object and considering it from an overly individual point of view, theoretical art history activates the object as the subject of art-historical problems. In this move from seeing to representation, the work of art becomes a historical object that is queried and analyzed through the various methodologies of the history of art. Although, as Panofsky maintains, knowledge in the scientific sense cannot be achieved in art history, the historical object operates as if it were an object of possible knowledge when fundamental principles are pursued through the orientation of Kunstwissenschaft. an immediate indication of the meaning itself; yet they are the source of those insights without which the grasp of meaning is, often enough, impossible…. And now we are at the point where the effort to establish the perception of the immanent meaning needs the help of 'documents', primarily to secure the phenomenal understanding of the given artistic phenomenon. Panofsky's turn toward an analysis of documents, Lang (2006, p. 29) argued, marked a shift from the consideration of immanent meaning to one of 'phenomenal understanding'. The interpreter is aware of the essential tendencies of the human mind as conditioned by psychology and world view; he [Panofsky] analyses the history of cultural symptoms or symbols, or how tendencies of the human mind were expressed by specific themes due to different historical conditions. Moreover, when understanding the work of art as a document of a specific civilization, or of a certain religious attitude therein, the work of art becomes a symptom of something else, which expresses itself in a variety of other symptoms. Interpreting these symbolical values, which can be unknown to, or different from, the artist's intention, is the object of iconology. Mazzola (2015, pp. 417–8) provides an example of the three levels of analysis of a painting; Peter Paul Rubens' (c. 1635) The Three Graces in the Museo Nacional del Prado. i. Pre-iconographic description: refers to the listing of motifs (pure forms recognized as holders of primary or natural meaning). In the picture, we recognize (we perceive from traces, colors, volumes) three naked female figures in movement of dance: two of the graces look at one direction and the third, at the opposite direction. A veil involves them, and their expressions are of joy. In the same way, we recognize elements of the nature around them, as a tree that serves as frame on the left, a garland of flowers at the top, and a picturesque landscape at the bottom, with goats grazing. There is still a fountain, on the right, where we observe the sculpture of a boy holding a cornucopia from which pours the water. This constitutes the pre-iconographic description: a) identification of pure forms and b) perception of some expressional qualities. ii. Iconographic analysis: refers to the connection of motifs or combinations of motifs (compositions) with the subjects and concepts. It is what we call 'images'; and the combinations of these images are called 'stories' and 'allegories'. Thus, the three female motifs together in movement of dance configure the image of the Three Graces, Greek goddesses of dance and movement (Aglaea, Thalia and Euphrosyne), daughters of Zeus with Eurynome; they are followers of Aphrodite and Olympian dancers. 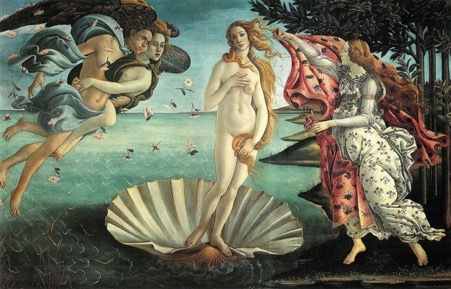 It was their job to decorate Aphrodite (Venus) when she left to seduce. Initially, they presided all human pleasures, and were thus portrayed by Rafael, in his version of the picture. Subsequently, they started to represent the conversation and works of the spirit, and thus Rubens portrayed them. The fountain, on the right of the picture, together with the cornucopia held by the cherub, is, in the Greek mythology, a symbol of abundance and nutrition. This level of artistic apprehension presupposes much more familiarity with objects and facts. This presupposes the familiarity with specific themes or concepts, just as they are transmitted through the literary sources, whether obtained by deliberate reading or oral tradition. The meaning, in this case, is conventional. iii. Iconological interpretation: this is a matter of observing the intrinsic meaning or content of a work; of treat it as a symptom of the society, according to Foucault (2000). In this level, it is more explicit the apprehension of the basic attitudes of a nation, of a period, of a social class, of religious or philosophical beliefs, etc. For instance, we understand the privileged statute that possessed the paintings whose themes were the mythological narratives in this context of the European baroque, in general, and Flemish, in particular. We can also identify a certain pattern of female beauty of the 17th century, without disregarding the issue of the style (Wölfflin, 1989), incarnated by the Three Graces; the plump shapes represented an elegance pattern of that historical moment. We invite the readers to consult again the painting of P. P. Rubens (Figure 1): something seems to draw the attention when we observe the Grace that is found with the back to us, spectators. The back of this central figure, more precisely her backbone, seems to adopt an artificial curvature, although the whole of this motif (The Three Graces) reflects naturalness and harmony of the movement. Would it be this body position impossible to be achieved? We proposed this hypothesis based on the reports very known on the sacrifice of a certain anatomical realism—that is, of the exact correspondence of the body portrayed with the real body—as a function of the conquest of certain aesthetic effects. In the case of the painting of Rubens, some exaggeration in the backbone curvature of one of the Graces results in an aesthetic effect of harmonious movement. Bulfinch (2006) lists that the Graces were goddesses of dance, feast, of all social entertainments and fine arts. Among these practices, Rubens shows in his canvas the ability of dance. The harmony of the movement is the aesthetic effect desired. Although in such paintings (and she also referred to the elongated neck in Botticelli's The Birth of Venus, for example (Figure 2)) there are elements that, taken in isolation, would be considered deformed or disproportionate, or even inharmonious. However, she claims that for the paintings as a whole, and 'in accord with other elements that contribute to the cosmos of the meaning produced, perceived in its unit, we observe the emergence of the aesthetic harmony' (Mazzola, 2013, p. 418). 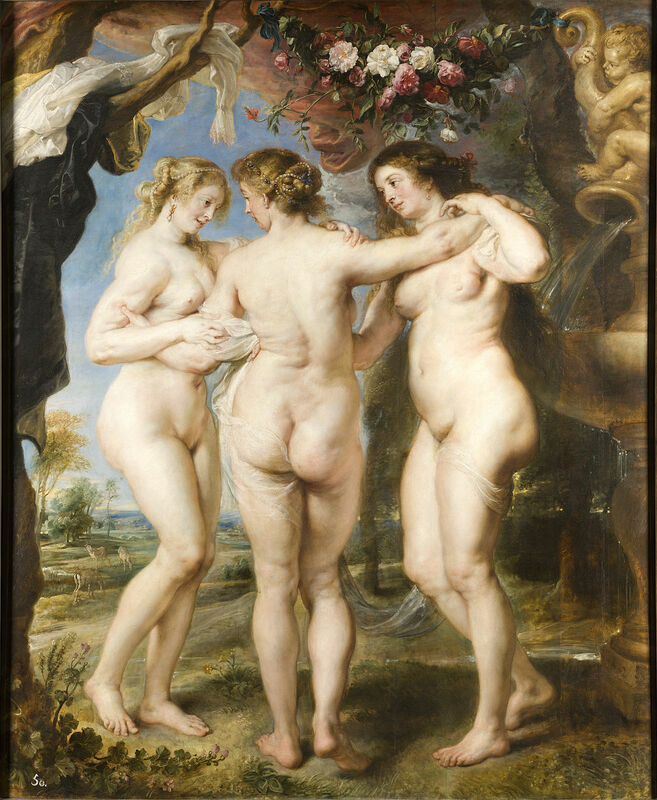 In the Rubens painting, the exaggeration in the backbone curvature creates an aesthetic effect of harmonious movement. The anatomical strangeness found in the European paintings analyzed show that it is not necessary to have an accurate correspondence between the real body and the body portrayed, provided that they operate according to the aesthetic effects desired by the artists…. [They] through techniques and practices, were all, by sacrificing the anatomy, able to bring up the movement, tenderness and desire. (Mazzola, 2013, p. 420).